Roechling Automotive and Plastic Omnium help reduce the drag coefficient in the new Nissan Qashqai to 0.32 from 0.34 in the previous generation. This helps reduce the new car’s CO2 emissions to a 99 grams per kilometer from 119g/km. Roechling supplies the new Qashqai's active grille shutters, which are standard on diesel models with manual transmissions. The technology maximizes aerodynamic efficiency by using controllable air guides to close off airflow through the radiator at speeds of more than 30kph. The guides only open when sensors detect the engine requires cooling. French automotive exterior specialist Plastic Omnium supplies the Qashqai with its integrated rear roof spoiler, which incorporates wingletts to improve airflow across the rear of the car to reduce drag. 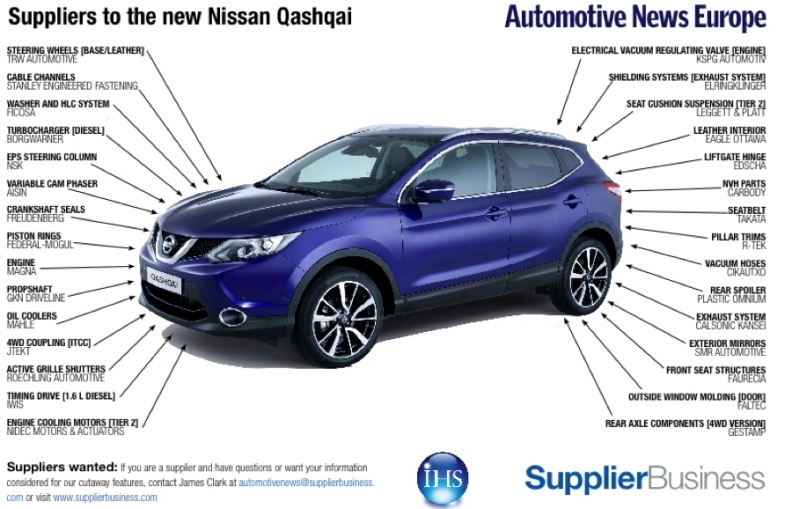 The second-generation Qashqai is built at Nissan's factory in Sunderland, England. Output is forecast to peak at more than 260,000 units in 2014, IHS Automotive forecasts.